The Massachusetts Executive Office of Transportation and Public Works – Massachusetts Asset Management Plan is available here. 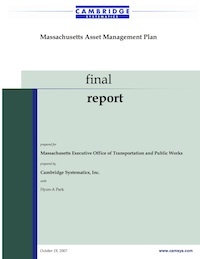 The Massachusetts Executive Office of Transportation and Public Works developed this asset management plan in order to address challenges to their investment decision-making process. The objectives of the plan include developing a work plan to guide the MassHighway Asset Management Steering Committee, and developing an asset management plan for the Interstate System. This document includes the following sections: Introduction, Inventory and Condition, Objectives and Measures, Process Improvements.